The leaves, which have a charac­ter­istic shape due to their winged petioles, which almost look like leaves them­selves; if avail­able, the fruits, especially the fruit skin, may also be used. 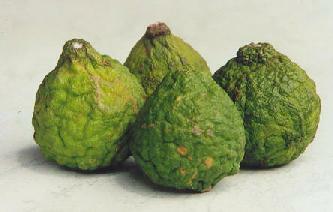 Rutaceae (citrus family). 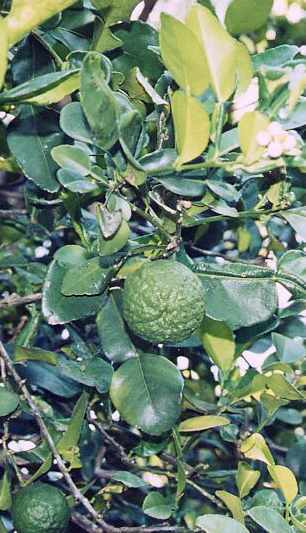 Within the genus Citrus, kaffir lime belongs to subgenus Papeda and is, therefore, less closely related to those species yielding the popular citrus fruits. Strongly lemon-like. Although many people judge the fragrance crude, dominating and penetrating on first contact, most will find it uniquely refreshing after having grown accustomed to it, especially if blended with other flavours. 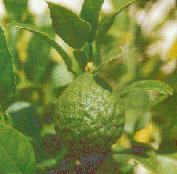 The compound responsible for the characteristic aroma was identified as (–)-(S)-citronellal, which is contained in the leaf oil up to 80%; minor components are citronellol (10%), nerol and limonene. Form a stereo­chemical point of view, it is remarkable that kaffir lime leaves contain only (–)-(S)-citronellal, whereas the enantiomeric form (+)-(R)-citronellal is found in both lemon balm and (to a lesser degree) lemon grass, (note, however, that citronellal is only a trace component in the latter’s essential oil). Kaffir lime fruit peel contains an essential oil comparable to lime fruit peel oil; main components are limonene and β-pinene. See also lemon and lime. Frankly, I do not know why the kaffir lime is called so. The word kaffir , in English and many more Euro­pean lan­guages, is used as an of­fen­sive term for Blacks in general; histori­cally, it was parti­cularly a­pplied to the Xhosa, a people indi­genous in South Africa, in a xeno­phobic way. It comes from Arabic kafir [كافر] infidel, non-Muslim , via obsolete Spanish and Portu­guese cafre barbarian . The ultimate source is a Semitic root KPR village , with a de­roga­tory con­nota­tion of back­ward­ness. Ap­parent­ly, the meaning in­fidel arose from an impli­cation of re­tarded or in­complete Islami­zation in remote villages. Distantly related is Turkish gâvur infidel , which was entered English as an exotism giaour. Cf. also the German term Kaff (derogatory for remote place, small village ), which might have Yiddish sources, although others derive it from Romany gāw village . The species name hystrix (Greek hystrix [ὕστριξ] porcupine ) refers to the many thorns of the plant. The kaffir lime leaves are a very popular spice in Thai­land; their charac­teristic flavour ap­pears in soups, stir-fries or curries (see coconut for a list of other in­gre­dients to Thai curries). In Thai cuisine, kaffir lime is frequently combined with garlic, galanga, ginger and fingerroot, together with liberal amount of chiles. Fresh Thai basil is needed for the authentic fragrance. A Thai dish most popular in Thailand and among foreigners is tom yam (also spelt tom yum [ต้มยำ]), a fiery–hot, sour and very aromatic soup prepared from shrimps (tom yam gung [ต้มยำกุ้ง]), chicken (tom yam gai [ต้มยำไก่]) or fish (tom yam pla [ต้มยำปลา]). The soup is flavoured with loads of chiles, lime juice, fish sauce and fresh spices: galanga, lemon grass and kaffir lime leaves. It is served topped with aromatic greens, usually basil (horapha) or coriander. A related soup is tom khaa [ต้มข่า], which contains more galanga and is less spicy due to a splash of coconut milk added. Similar soups are prepared in other South East Asian countries; see rice paddy herb for a Vietnamese example. 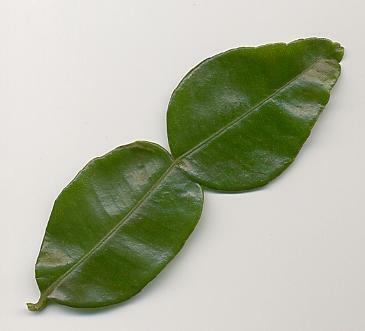 Kaffir lime leaves are also popular in the West of Cambodia, but less so in Vietnam. Malay and Indonesian (especially, Balinese; see also Indonesian bay leaf) cuisines use them sporadically for chicken and fish. Kaffir lime has a very strong, characteristic fragrance that cannot easily be substituted by other spices; lemon myrtle leaves or simply lime peel is probably the best substitute. Dried leaves lose their flavour within a year; therefore, they are better kept frozen. 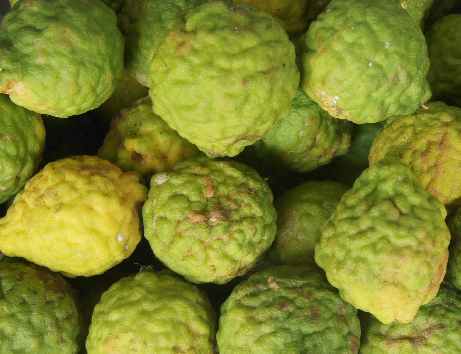 The fruit juice, which is very sour and has the same fragrance as the leaves, is sometimes added to fish or poultry dishes in Malaysia or Thailand. Less commonly, it is also used in Indonesia. For a summary of sour spices, see mango.